Nestled on the tip of the world-renowned Palm Jumeirah, this luxury beachfront living acquiesces the uninterrupted views of Atlantis The Palm and Burj Al Arab, and the most dramatic views of the Persian Gulf’s beachscape and the sunset and the Dubai skyline. Designed over three floors, this mansion comprises a spacious open-plan layout, with built-up areas ranging from 13,800 Sq. Ft. and waterfront plots ranging from 13,598 Sq. Ft.
Other features are the panoramic elevator, 14,100 Sq. Ft. of interior space, three reception rooms, open terraces, a formal dining room, a modern kitchen fully equipped with Siemens appliances, en-suite bedrooms, a master suite with Jacuzzi and terrace, panoramic sea view from every room and lounge, a 2,000 Sq. Ft. roof terrace overlooking the sea, and private beach with 200 Ft. frontage. 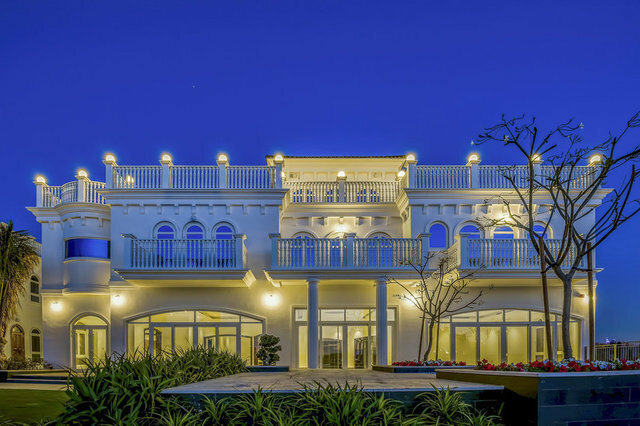 This mansion also presents landscaped gardens, infinity pool, smart home system, maid/driver’s room, and four car parks. Its design conforms to green building standards.